The conflict behind this skirmish between British and French fishers in the Bay de Seine at the end of August 2018 was quickly dubbed the "scallop war" in the press. The French had been trying to prevent the British scallop dredgers from legally fishing the beds in French national waters. But the incident exposed tensions that have been simmering for many years. Under the European Union's Common Fisheries Policy (CFP), the British fishers had the legal right to fish in these waters, as did any boats from an EU member state. The complication came from a French regulation that prevented local boats from fishing these waters between May 16 and September 30 each year, in order to allow stocks to recover from the annual harvest. But under the CFP, an EU country has no authority to prevent another member state's fleet from fishing its waters. This incident in a small corner of a shared EU sea was settled within a few weeks thanks to a new agreement on how the two countries would share the scallop harvest. But the underlying tensions that the CFP has created over the sharing of national resources go much deeper, with a sense that the rules don't allow for a fair use of the seas. This sense of unfairness was obviously expressed in the role that fishing played in Britain's decision to leave the EU. Campaigners promised that "taking back control" of British waters would enable the country to revive its long-declining fishing industry and the communities that rely on it. Yet regardless of the impact the CFP has had on Britain's fishers, their future after Brexit depends very much on any future trade deal that the government negotiates with the EU. And the history of how Britain has responded to conflicts over fishing rights far bigger than the scallop war doesn't bode well for the industry. To further meet this growing demand, steam trawlers started to replace sail trawlers from the 1880s onwards. The power of these steam vessels greatly increased the scope of trawling and allowed them to trawl for longer and further away from port while towing larger nets. British steam trawlers ventured further away from Britain in search of fish, with the fishing grounds expanding to areas as far as Greenland, north Norway and the Barent's Sea, Iceland and the Faroe Islands. Overfishing wasn't the only reason for decline, however. 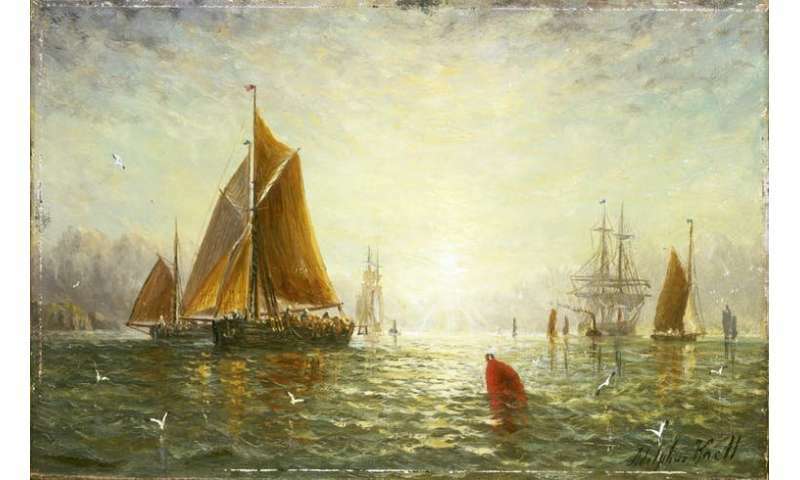 The falling fish stocks combined with the improvements in the range and power of the fleet in the post-war years led Britain's fishers to seek new waters, with more boats moving further away from the UK to catch enough fish to meet domestic demand. And this long range trawling brought the UK fleet into conflict with Iceland. British fishers had fished these waters from the 15th century. However, Iceland's fishing industry began to resent this as the steam trawlers began fishing off Iceland in the late 19th century. It led to accusations that British trawlers were damaging the fishing grounds and depleting stocks. In 1952, Iceland declared a four-mile zone around their country to stop excessive foreign fishing, although fish don't stick to human-made boundaries and stocks could still be depleted outside of this zone. Iceland's decision drew a response from the UK, which banned the import of Icelandic fish. As a major export market for Iceland's most important industry they hoped that this would bring them to the negotiating table. During the first Cod War, Royal Navy frigates accompanied the UK fleet into Iceland's exclusion zone to continue their fishing. 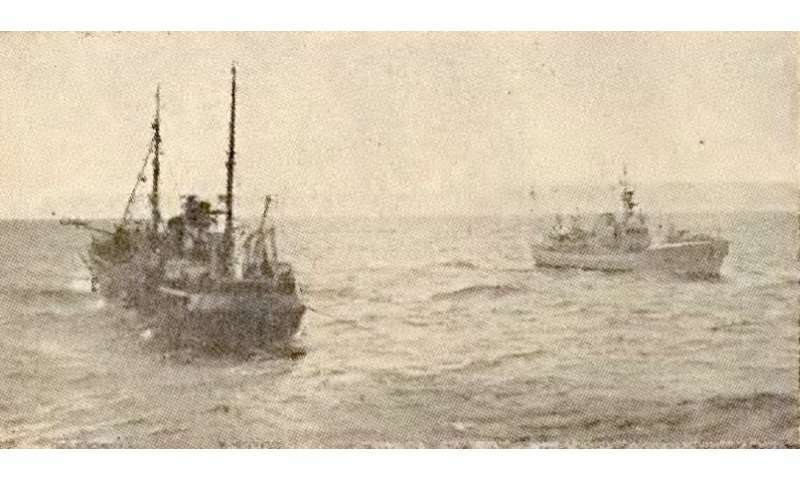 A game of cat-and-mouse ensued between the Icelandic Coastguard vessels and the British trawlers. In response to attempts to seize them, the trawlers rammed the coastguard vessels and the coastguard threatened to open fire, although major incidents were avoided. 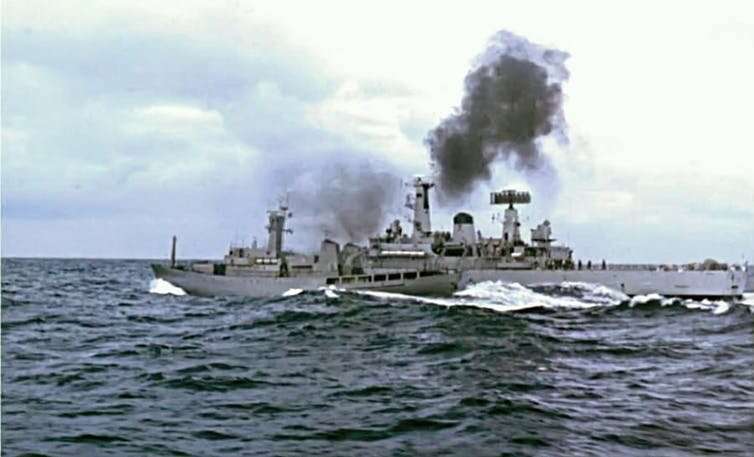 In January 1976, British naval frigate HMS Andromeda collided with Thor, an Icelandic gunboat, which also sustained a hole in its hull. While British officials called the collision a "deliberate attack", the Icelandic Coastguard accused the Andomeda of ramming Thor by overtaking and then changing course. Eventually NATO intervened and another agreement was reached in May 1976 over UK access and catch limits. This agreement gave 30 vessels access to Iceland's waters for six months. NATO's involvement in the dispute had little to do with fisheries and a large amount to do with the Cold War. Iceland was a member of NATO, and therefore aligned to the US, with a substantial US military presence in Iceland at the time. Iceland believed that NATO should intervene in the dispute but it had up until that point resisted. Popular feeling against NATO grew in Iceland and the US became concerned that this strategically important island nation – which allowed control of the Greenland Iceland UK (GIUK) gap, an anti-submarine choke point – could leave NATO and worse, align itself with the Soviets. The loss of these Atlantic fishing grounds cost 1,500 jobs in the home ports of the UK's distant water fleet, concentrated around Scotland and the north-east of England, with many more jobs lost in shore-based support industries. This had a significant negative impact on the fishing communities in these areas. 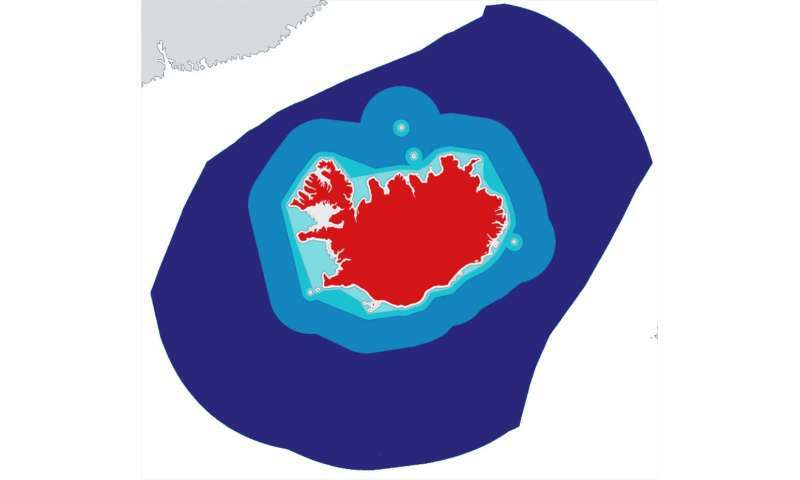 The UK also established its own 200-mile limit in response to Iceland's exclusion zone. These limits were eventually incorporated in the 1982 United Nations Convention on the Law of the Sea, giving similar rights to every sovereign nation. The creation of these "exclusive economic zones" (EEZ) was the first time that the international community had recognised that nations could own all of the resources that existed within the seas that surrounded them and exclude other nations from exploiting these resources. The UK now owned the rights to the 200-mile zone around its islands, which contained some of the richest fishing grounds in Europe but up until this point the principle of "open seas" had existed, with Britain its most vocal champion. Fishing nations, had fished the high seas within 200 miles of their own and others coasts for centuries and now were restricted to their own. Britain's Exclusive Economic Zone (EEZ), however, wasn't that exclusive. Although the fishing industry is of high local importance to fishing communities, it is relatively unimportant to the UK economy as a whole. In 2016, the UK fishing industry (which includes the catching sector and all associated industries) was valued at £1.6 billion, against £1.76 trillion for the UK economy as a whole – or just under 1%. The UK's trade with the EU, both import and export, stands at £615 billion a year in comparison. In 1983, the Common Fisheries Policy was adopted, introducing management of European waters by giving each state a quota for what it could catch, based on a pre-determined percentage of total fishing opportunities. This was known as "relative stability" and was based on each country's historic fishing activity before 1983, which still determines how quotas are allocated today. As a result, only 32% of fish caught in the UK EEZ today is caught by UK boats, with most of the remainder taken by vessels from other EU states, Norway and the Faroe Islands (who have also joined the CFP). Therefore, non-UK vessels catch the remaining 68%, about 700,000 tonnes, of fish a year in the UK EEZ.In return, the UK fleet lands about 92,000 tonnes a year from other EU countries' waters. Joining the CFP did not cause a decline in UK fish landings. However, in its early days, it did nothing to stop it. Fish landings continued to decline – and along with this, the industry itself contracted, using improved technology to offset the decline in stocks. Through the 1980s and into the early part of this century the imbalance – enshrined in the relative stability measure of the CFP – has led to the view that the CFP doesn't work in the UK's interests. Rather it allows the rest of the EU to take advantage of the country's fish stocks. The CFP's quota system, while credited for helping the industry survive (and even reverse the collapse in fish stocks), is now seen as burdensome and preventing further growth. For example, a 2013 reform of the CFP introduced the landing obligation, the so-called "discard ban", that was designed to stop vessels discarding fish (bycatch) caught alongside the species they were targeting. Environmentalists, and campaigns backed by celebrities such as Hugh Fearnley-Whittingstall, have long voiced concerns over incidents of bycatch being dumped by fishers operating under the quota system. This policy is now seen as potentially disastrous by some representatives of Britain's North Sea fishing fleet, as so many different types of fish live in the waters and bycatch is common and often unavoidable. They are concerned that boats would be forced to fill their holds with commercially worthless fish and return to port early. Or by exhausting their quota for some species early in the season, they would be forced to stay in port for the rest of the year, despite having quotas available for other species. Evidence given to the House of Lords suggests that this situation has not arisen as non-compliance and a lack of enforcement has undermined the discard ban. But will Brexit really bring the fishing revival so many have promised and hoped for? British politicians have promised a renaissance in UK fishing after leaving the EU. A Fisheries Bill was launched by the environment secretary, Michael Gove, with an aim to "take back control of UK waters". However, no definitive plan to remove the UK from the CFP in a transition deal has been made, nor has the industry been given any answers on future access for EU vessels, the apportionment of any new quota – if indeed the quota system remains as it is – the rules that they will be operating under, or even a date on which this will come into effect. The fishing industry's distrust of the government has a long tail: many believe they were sacrificed in 1973 by the then prime minister, Edward Heath, in order to secure access to the single market. Ironically, despite the fishing industry's support for Brexit and the popular campaign promises, our research suggests fishers don't simply want to close British waters to European fleets. We interviewed people who were sympathetic to their fellow fishers from abroad and did not wish to see businesses and livelihoods lost. They favour a re-balancing of quotas over time to allow EU vessels to adapt to the change, with all vessels having to adhere to UK rules. This would avoid any situations similar to the Scallop War by ensuring that all vessels with a quota have to abide by local restrictions. The issue centres on the word "control". If the UK has control of its waters that would simply mean that its government has the power to decide on anything from keeping fishing within UK waters purely for UK vessels, to remaining in or re-entering the CFP, or all points in between. Until the deals are negotiated and signed, the industry will remain in a limbo that has reopened old wounds and reignited distrust in the UK government. Hah! The Brits have a long history of trading away fishing access? & the reason? Was their long history of smuggling & other sordid criminal activities. Which in turn masked national defense interests. Such as espionage ops & maintaining a large pool of self-supporting mariners. Getting all self-righteous & priggish promoting legalistic regulations? Meant you were probably not a loyal subject of HRH government!